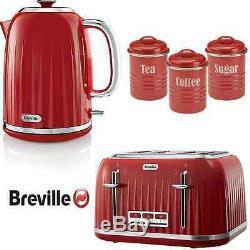 Red Breville Impressions Kettle and Toaster Set + Vintage Tea Coffee Sugar Ca.. Looking for a matching colour microwave, kettle toaster set or other matching colour appliances for your kitchen? You're in right place, we're also creating custom appliances sets for your requirements. And we'll answer you within 2 hours or choose colour or style below to see our full range of microwave kettle & toaster sets or other coloured kitchen appliance sets. Breville Impressions Kettle - Red. Stylish contemporary ridged design with high gloss finish. Lift off lid for easy filling. 1.7 Litre capacity makes 6-8 cups. Removable, washable lime scale filter. The Red Breville Impressions VKT006 Jug Kettle comes in a stylish ridged textured designed with a high gloss finish and silver accents. With a 3kW element, the kettle boils in no time even when filled to its 1.7L capacity, which is enough to make around 6 â 8 cups of your favourite beverage. When less water is needed, the rear water gauge helps save energy by allowing you to boil just the right amount and when boiling, it emits an elegant blue illumination. Non slip feet make the kettle more stable on your worktop and the 360 degree base makes it easy to use for left and right handed people. The Breville Impressions Kettle also comes with a handy lift off lid that helps keep splashes to a minimum when filling which, along with the cord storage, helps keep your kitchen clean and clutter free. Breville Impressions 4 Slice Toaster - Red. Defrost, reheat, mid-cycle cancel functions. The Red Breville Impressions VTT783 4-Slice Toaster comes in a stylish ridged textured designed with a high gloss finish and silver accents. It has a defrost button allowing you to make toast with bread straight from the freezer, a mid-cycle cancel button and a reheat button which lets you reheat cooled toast, all of which illuminate when in use. It also features extra wide slots to accommodate thicker pieces of bread and extra high lift so no more burned fingers with smaller items. While most toasters come with only 6 or 7 browning controls, the Breville Impressions has 9 meaning you get the perfect toast every time, however you like it. When only 2 slices are required, the independent dual slots help you save energy and for safety, it also has cool wall technology which keeps the sides cooler when in use. Two removable crumb trays that are machine washable help keep your kitchen tidy and cord storage helps keep your worktops clutter free. Typhoon Vintage Tea, Coffee and Sugar Canister Set - Red. Product Size: (H) 12cm x (D) 10.5cm. The Typhoon Vintage Tea, Coffee and Sugar Canister Set comes with a stylish vintage look that will add a touch of class to any kitchen. Built to last, they are made with an enamel coated steel design while the lids have an inbuilt silicone ring ensuring a perfect airtight seal and a small handle that makes them easy to open. Each canister is individually marked with either Tea, Coffee or Sugar for your convenience and are easy to clean with a rinse or in the dishwasher. ALL ITEMS SENT DIRECTLY FROM APPROVED 3rd PARTY SUPPLIERS. These items may be dispatched directly to you from a third party distributor. You must have a confirmed address. This allows our products to remain very competitively priced. Please note, bundled items may arrive separately and on different days because we may use different suppliers. We may also re-use packaging when appropriate as an attempt to reduce our overall environmental impact on the planet. Please note that any pre-existing damage of the received item/s MUST be communicated within 24 hours after the item has been received; failure to do so may result in us (on our supplier's behalf) not granting you the return. The item "Red Breville Impressions Kettle and Toaster Set + Vintage Tea Coffee Sugar Ca" is in sale since Saturday, November 19, 2016. This item is in the category "Home, Furniture & DIY\Appliances\Coffee, Tea & Espresso Making\Kettle & Toaster Sets". The seller is "*microwave-kettle-toaster-sets*" and is located in London. This item can be shipped to United Kingdom.